In this article, I would like to discuss a few Spring boot best practices that we can use in our Spring boot applications. Here, I will show you recommended ways to create spring boot project structure in Spring boot applications, which will help beginners to maintain standard coding structure. Here, I recommend two approaches to create a standard project structure in Spring boot applications. Spring Boot favors Java-based configuration. Although it is possible to use SpringApplication with XML sources, I generally recommend that your primary source be a single @Configuration class. Usually, the class that defines the main method is a good candidate as the primary @Configuration or @SpringBootApplication annotation. It is always a good practice to divide a large Spring-based configuration file into multiple files as per your convenience. I generally keep Database configuration in one file (DatabaseConfig), Spring MVC beans in another file etc, and then finally import in the main file. Below example demonstrate the same here. You need not put all your @Configuration into a single class. The @Import annotation can be used to import additional configuration classes. You should only ever add one @SpringBootApplication or @EnableAutoConfiguration annotation. Spring boot team generally recommend that you add one or the other to your primary @Configuration class only. I observed in many of the spring boot open source application, the Spring Data JPA repositories directly called in Controller classes in Spring boot applications. I generally use Service class annotated with a @Service annotation to write business-related logic so you can follow this approach. For example, UserService, CustomerService, EmployeeService etc. I listed a few free spring boot projects here at 10+ Free Open Source Projects Using Spring Boot article. If you use predominantly constructor injection, it is possible to create an unresolvable circular dependency scenario. For example - Class A requires an instance of class B through constructor injection, and class B requires an instance of class A through constructor injection. If you configure beans for classes A and B to be injected into each other, the Spring IoC container detects this circular reference at runtime and throws a BeanCurrentlyInCreationException. One possible solution is to edit the source code of some classes to be configured by setters rather than constructors. Alternatively, avoid constructor injection and use setter injection only. In other words, although it is not recommended, you can configure circular dependencies with setter injection. Handle proper exceptions and custom error messages for RESTful Web Services developed using Spring Boot. Check out this article - Spring Boot 2 Exception Handling for REST APIs. I have written a separate article of Restful API design best practices. 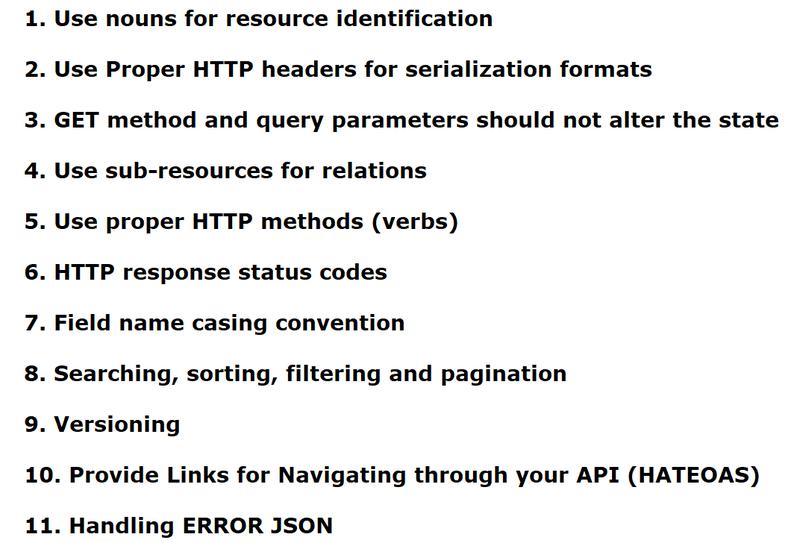 Here is a list of best practices to design a clean RESTful API. I hope this article is useful to you. Leave a comment if you have any suggestion or feedback about this article.